Spirits were high as over two hundred current and former Aquinians descended on the Priceline Netball Courts for the finals of this year’s HTC Netball on 27 March. Both the men’s and women’s teams had made it through to their respective finals, without dropping a game in the preliminary rounds. The women’s match was a replay of last year’s final, with a tough game against Flinders. After allowing their opponents from Bedford Park to skip to a 5-goal lead, the Aquinas girls edged their way back, goal by goal. Midway through the third quarter they began to dominate and to cement their lead, eventually running out winners by 9 goals in a decisive victory. 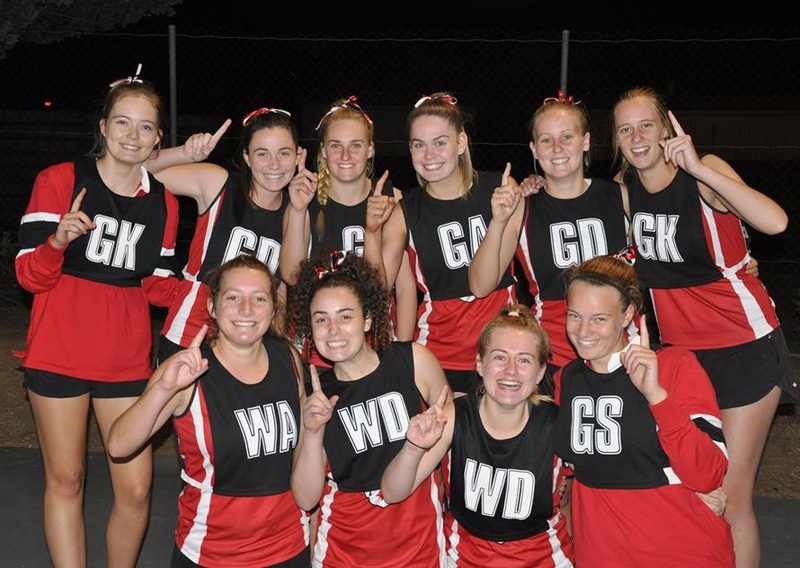 The men were defending an unbroken run of 15 years as netball champions. The Wolves’ opponents this year were a St Ann’s team who boasted some fairly tall timber and a menacing game plan, but in previous rounds Aquinas had won against them. In a low-scoring game St Ann’s maintained a 2-3 goal lead which they managed to establish in the first minutes of the opening quarter and which Aquinas was not able to bridge despite a late rally. So the 2019 HTC Netball finished with Aquinas as Champions and Runners-Up.